Flashing victory signs, troops of the United Arab Emirates-trained Giants Brigade armed with automatic weapons and rocket-propelled grenades rolled down the city's streets in pickup trucks bearing their brigade logo spray-painted in red, a journalist working for AFP reported. 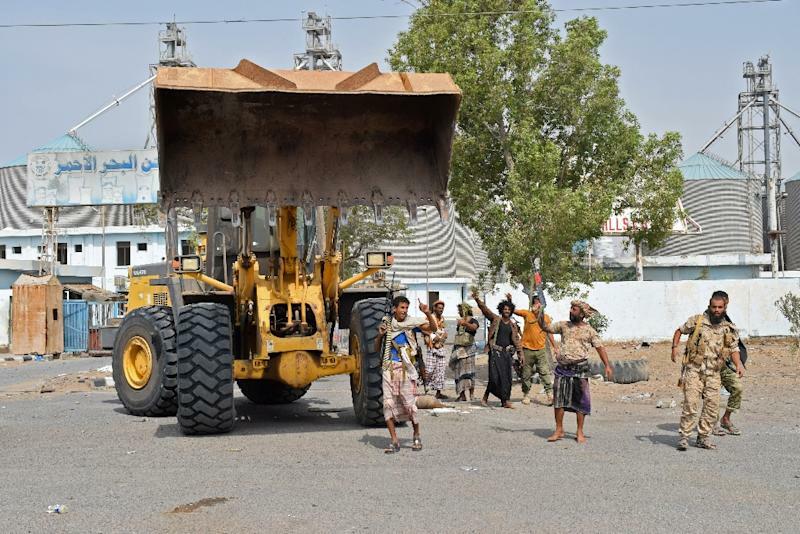 Three military sources said that government forces and their coalition allies were edging towards the city's vital port through which nearly 80 percent of Yemen's commercial imports and practically all UN-supervised humanitarian aid pass. "Either the rebels surrender the city peacefully or we take it by force, but we will take it either way," commander Moammar al-Saidy told AFP. The deaths bring the overall toll from seven days of fighting to 250 combatants killed -- 197 rebels and 53 loyalists. "We will clean the streets of the city... of Huthi militias and we will continue to advance beyond Hodeida," said fighter Fadel Abbas. "This is not happening and will not happen ever," he said. 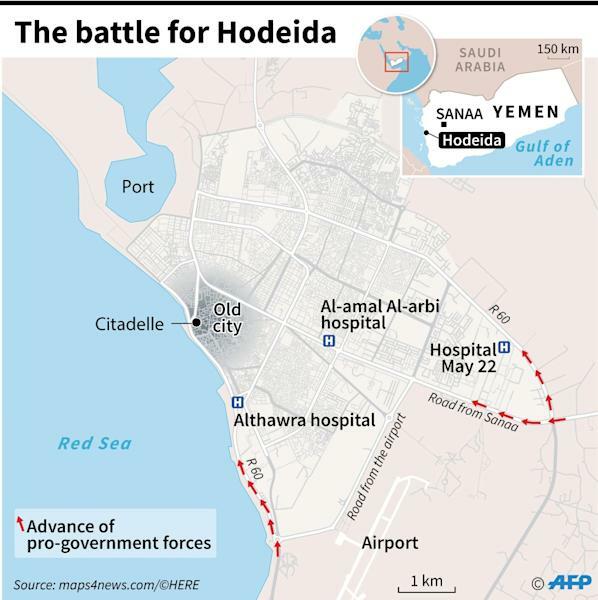 And the rebels said Thursday evening that they had "cut the supply routes" for pro-government forces in four parts of Hodeida province outside the city. Pedestrians and cars poured into Jizan Road, a main street in the city's north. 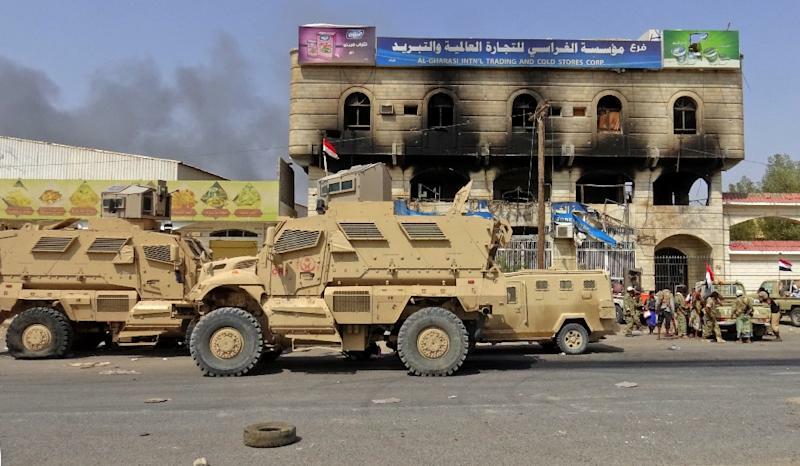 On Thursday, Amnesty International accused the rebels of "deliberate militarisation" of one of Hodeida's main hospitals, saying they had placed snipers on the roof of the facility in the May 22 district. At another of the city's major hospitals, Al-Thawra, just metres from the front line, a 10-year-old boy died of malnutrition Thursday, the UN children's agency UNICEF reported. "We're running out of words to describe how wretched the situation is," said Fabrizio Carboni, International Committee of the Red Cross Middle East director, in a statement.